There are many ways in which AI is being applied – from chatbots, image recognition, autonomous vehicles, speech and text applications, and many more. Despite all these different applications, Cognilytica has observed that there are only seven different patterns in which AI is being implemented. AI Projects generally use one or more of these patterns to accomplish their objectives. 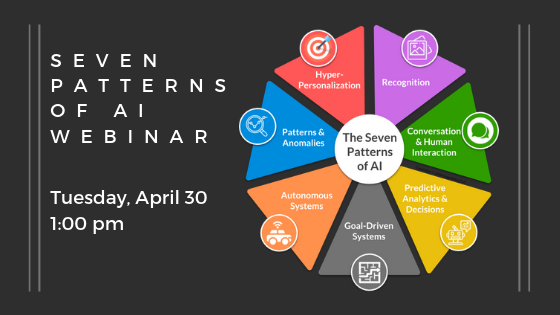 In this webinar, Cognilytica analysts Kathleen Walch and Ronald Schmelzer will explain the seven patterns, and how they relate to successful implementation of AI projects. The patterns explained are Hypersonalization, Autonomous Systems, Predictive Analytics & Decision Support, Conversational / Human Interaction, Patterns & Anomalies, Recognition, and Goal-Driven Systems. All AI projects or implementation utilize one or more of these patterns as part of the solution. Each pattern is implemented with its own machine learning / cognitive process. We’ll explain how to identify which patterns are being used in a project, and how to utilize emerging methodologies to implement those patterns with the greatest degree of success. In this webinar we’ll go over what each pattern is, questions your organization needs to answer to make sure you’re correctly using the pattern, and provide example use cases for how these patterns are implemented at organizations. We’ll also explore emerging AI-centric methodologies such as the Cognilytica Project Management for AI Methodology (CPMAI) and how it relates to implementation of the seven patterns.